AMERICA/UNITED STATES - Secure borders and humane treatment of those fleeing persecution and seeking a better life are not mutually exclusive. Secure borders and humane treatment of those fleeing persecution and seeking a better life are not mutually exclusive. Newark (Agenzia Fides) - In the message to the nation on Tuesday 8 January on the issue of migrants at the border, Donald Trump, President of the United States, attacked Central American migrants trying to enter the country. The President said that the southern border is a road through which illegal drugs enter, which would cause more deaths than "the whole Vietnam war". As a result he proposed creating a wall on the border with Mexico to stop drug trafficking. The White House presented a proposal to Congress to address "the humanitarian and national security crisis" that exists at the border, pointed out Trump. Among the reactions aroused by the President's speech, Cardinal Joseph William Tobin, Redemptorist, Archbishop of Newark, the following day issued a statement, also sent to Fides, which states: "I listened with deep disappointment to the dehumanizing words used to describe our immigrant sisters and brothers. These men, women and children are neither numbers, nor criminal statistics, but flesh and blood people with their own stories and histories. Most are fleeing human misery and brutal violence that threatens their lives. False and fear-filled caricatures seek to provoke a sort of amnesia that would have this great nation deny our roots in immigrants and refugees". The Cardinal then quotes Pope Francis, who last June, said in an address at a conference on international migration: "We must move from considering others as threats to our comfort to valuing them as persons whose life experience and values can contribute greatly to the enrichment of our society". 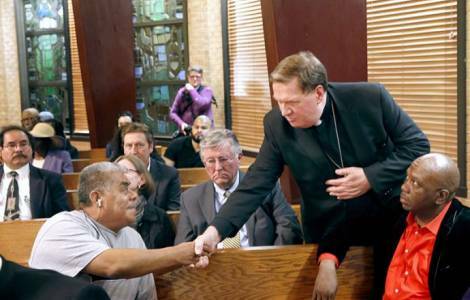 Then Cardinal Tobin continues: "Those coming to our borders seeking asylum or escaping crushing poverty are not pawns in a political debate, but rather the strangers and aliens our Scriptures constantly instruct us to welcome. As a Shepherd to God’s people in Northern New Jersey, I beg all our legislative leaders to come together for the common good. Work through your differences for the good of all. Lives literally depend upon it". Mgr. Joseph Vásquez, Bishop of Austin, Texas, Chairman of the Committee on Migration, in his statement yesterday, Thursday 10 January, calling for the President and Congressional leaders to create a border solution and end the government shut-down: "Secure borders and humane treatment of those fleeing persecution and seeking a better life are not mutually exclusive. The United States can ensure both and must do so without instilling fear or sowing hatred. We will continue to advocate for immigration reform to advance the common good and address these issues".